We are well and truly into the New Year. Resolutions have been broken, people are deciding their old selves weren’t too bad after all and the drinks cabinet is looking ever more tempting. A New Year brings new challenges and new goals, especially when it comes to improving our homes. Whether you’re a DIY novice or a professional installer, the demand for property renovations increases with every broken resolution. Bathrooms offer the perfect solution for those wanting to refresh their homes and potentially add value to their property. Second only to the kitchen, the bathroom dominates as one of the most important rooms in the home to improve or maintain. Showers are becoming increasingly popular in the home as people wish to be more economic with water consumption. Time pressed individuals and style conscious homeowners are now choosing showers over baths for convenience and as a space saving solution. So how do you go about installing one? Height adjustable shower tray and riser kit – these are a popular shower tray choice as they enable easy access to the pipes below the shower enclosure. 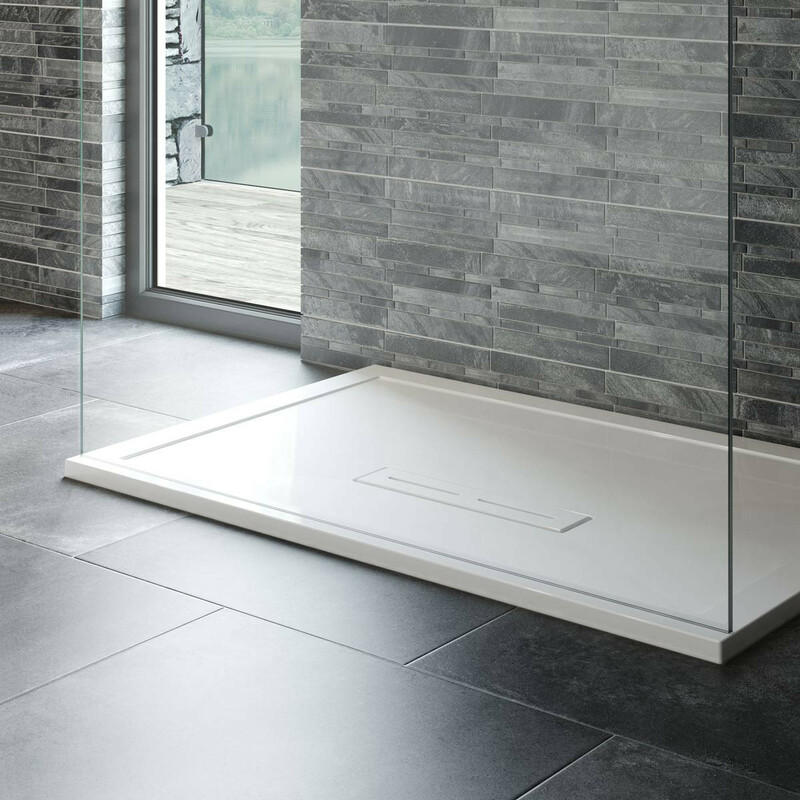 Low profile shower tray – these are great for accessibility as well as being the perfect contemporary option for seamless style. Place your new shower tray in the general position you intend to fit it. Use a pencil to outline the shower tray and be sure to use a spirit level to ensure that the space is flat. It vital that you ensure there are no issues with clearance or alignment. Fit the adjustable legs that came with your shower tray and adjust them to your desired height. Loosely attach the shower tray waste and ensure that below the shower tray it will be able to connect securely to your bathroom’s water waste. You may need to adjust the leg height to enable easy connection to the water waste. Use the included side panels to check the alignment and the height of the shower tray. Depending on your chosen height for the tray you may need to trim the side panels so they sit flush. Always follow the manufacturers instructions for the best fit. Ensure the legs and seals are properly tightened, use your spirit level to reaffirm that the shower tray is 100% level with the bathroom floor. This is vital for the design and functionality of the tray to make sure water is drained away effectively. Attach the underside of your shower tray waste trap to your water waste. Check for leaks by pouring water through the shower tray waste and adjust if needed. Once everything is correctly connected and the side panels are in place you can now seal the edges around the shower tray, starting where the tray where meets the bathroom walls. Finish the walls around your shower tray with your chosen tiles or wall panels, making sure to leave around 3mm gap between them and the tray. Then apply the sealant through this gap creating the secondary seal 24 hours after the initial seal. Finally, secure the side panels. The side panels will usually snap into place around the shower tray adjustable legs using supplied clips. Low profile shower tray installation is a more complex process so only try this if you are a confident DIYer. Before installing your shower tray shower be sure to use a spirit level to ensure that the space is flat and strong enough to withstand the trays weight. 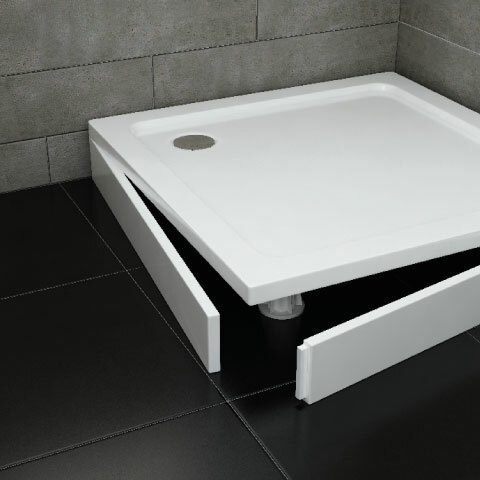 It is recommend to use 20mm+ thick marine plywood and creating a solid plinth for maintained and secure shower tray use. Cut an access hatch with a jigsaw into the floorboards next to your fitting area to easily access pipework once the low profile shower tray has been set. Locate the position of your low profile shower tray waste and that of your bathroom waste pipe so you can cut a recess around them. Clearly mark these areas making sure it is a comfortable fit before assembling the waste and putting it in place. Create a mortar mix which you can lay a thin even layer across the intended shower tray location. Apply your low profile shower tray gently upon the mortared area and press very lightly (a similar technique to laying floor tiles). Be sure to use your spirit level to ensure the tray is 100% level to the floor. Once correctly placed, leave the mortar for 24 hours before moving onto the next step. Use your access hatch cut beside the shower tray to connect the shower tray waste and your bathroom’s water waste pipe. Check for leaks by pouring water through the shower tray waste and adjust if needed. Carefully seal around the edges of the shower tray itself. Leave a 3mm gap for floor and wall tiles, then apply the sealant through this gap creating the secondary seal 24 hours after the initial seal. Should You Swap Your Conventional Boiler to a Combi?